The Province of Teramo holds a great many art treasures including several very early Christian-era temples. Dotted among the countryside are hilltop towns which once served as watchpoints and guardians of the deep and rocky valleys below. 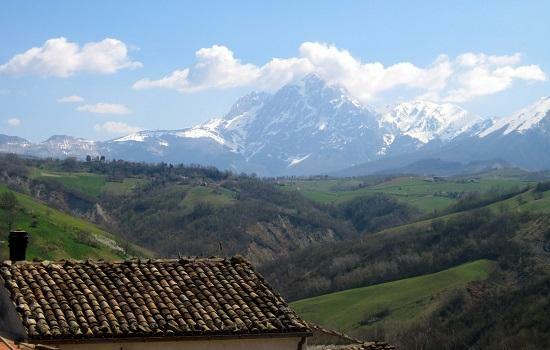 The province of Teramo borders with the Marche region (north), the province of Pescara and L'Aquila (south) and Lazio (west); it is characterized by the eastern side of the Apennine and by valleys gently sloping to the Adriatic coastline. Its territory counts 47 municipalities; in addition to the chief town Teramo, the most densely-populated ones are Roseto degli Abruzzi and Giulianova. The Piceni are one of the ancient populations who lived in this area, which then was included in the territory of the region Marche. 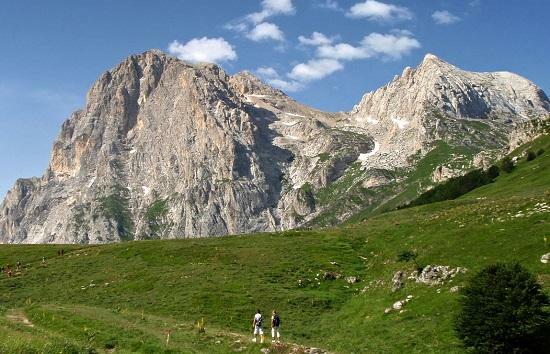 The territory is dominated by two major mountains: the Laga massif, with its woods, gorges and waterfalls, an the Gran Sasso d'Italia, representing the western border of the province and culminating with the Corno Grande (2912 mt). 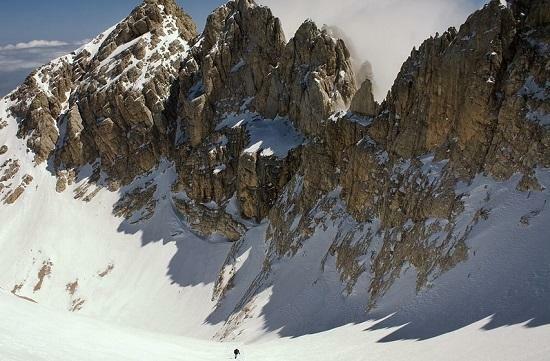 Here there is also the Calderone, the southernmost glacier of Europe. However the province is mostly hilly. 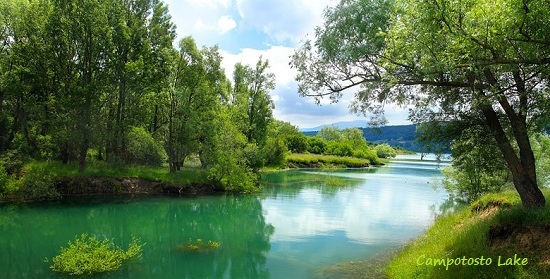 One of the several rivers flowing along the valleys is the Vomano, which creates the Campotosto lake. 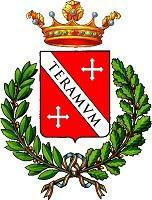 The province of Teramo was established in 1806 by the Realm of Naples, separating it from the actual province of L'Aquila . Because of its natural reserves it is the ideal destination for those who love photography, bird watching and trekking. 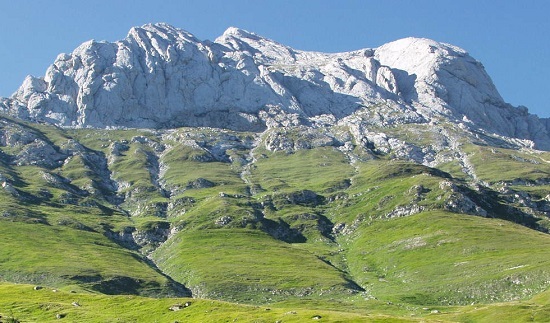 The Gran Sasso and Monti della Laga National Park is the largest and most important protected area in Europe: its 150thousand hectares of land are spread over three regions (Abruzzo, Marche and Lazio) and five provinces (L'Aquila, Teramo, Pescara, Ascoli Piceno and Rieti). The Park is the home of 1.600 vegetal species and a typical Apennine fauna: the wolf, the Abruzzi chamois, the bear and the golden eagle. You can make many different excursions, also by mountain bike, to completely immerse yourself in nature's calm and beauty. Among the most famous trails there is the "On the trail of Annibale", on the Laga mountains, and the trail for trekking on horseback on the Gemelli mountains, in the area of the characteristically horseshoe-shaped Clampi Mountain. The Valla Siciliana offers many trekking trails, such as Lu gir de lu Ncuume, a panoramic trail crossing several blooming fields during springtime. 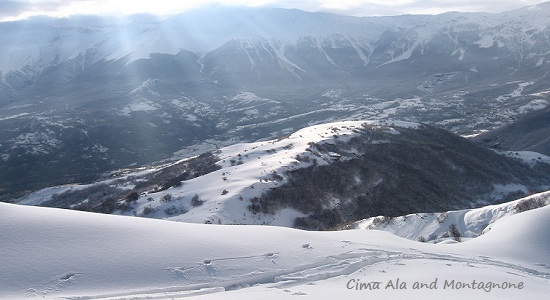 When the valley is covered by snow, the ideal trip is on the Cima Ala and Montagnone da Cerchiara. On the coastline there are the "seven sisters", the seven seaside resorts of the province ( Martinsicuro, Alba Adriatica, Tortoreto, Giulianova, Roseto degli Abruzzi, Pineto e Silvi ) with their sandy beaches and a mediterranean climate fostering the growth of palms, pine trees and oleanders. The coast also offers a variety of possibilities for those who love water sports. 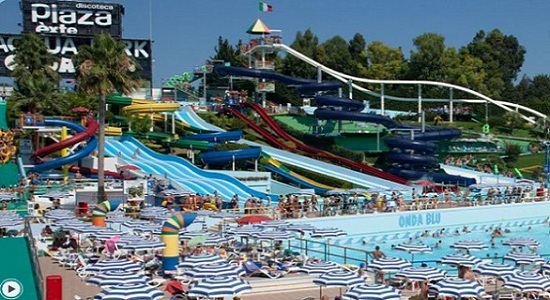 Bathing facilities have sport areas but there are also many clubs, pubs, disco-bars, the Acquapark, the kart racing track and riding schools. In summer, every town organizes cultural activities and wine-and-food tasting events to promote local products and handicrafts. 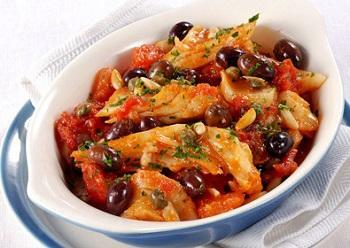 The typical products of this province are based on local fruit and rural flavors. The harvesting and selling of Valle Castellana chesnuts dates back to the XIII century. The Cacio marcetto is a typical inland cheese, creamy and gold, with its strong smell and strong flavour, it is also known as Pecorino marcetto. ​Marcetto’ means ‘rotten’ and gets its name from the fact that piophila casei ‘cheese fly’ larvae are added whilst the cheese is being matured. 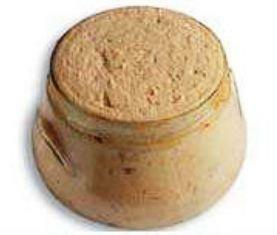 As the cheese starts to rot, it becomes creamy and pinkish, and develops a pungency that is rhapsodized by connoisseurs. It takes a year to mature. 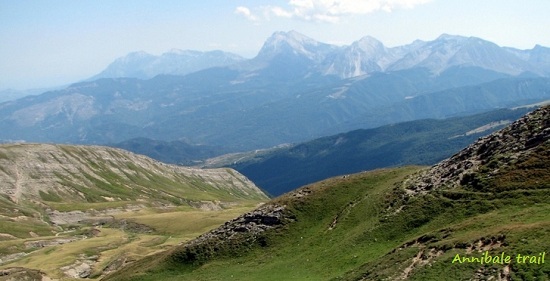 The ventricina teramana is produced between the mountains and hills of the Laga and the Gran Sasso. It's an especially fat salami (50-60% of the mixture), fine-grained and spreadable, light coloured and spicy. 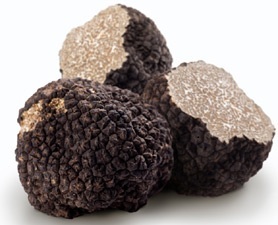 Tartufo della Laga - The truffle of the Laga (both black and white) is one of the most precious and sought-after products. 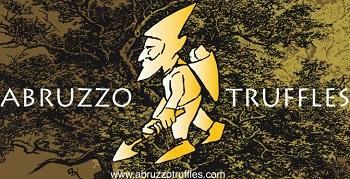 ​As well as growing spontaneously, truffles are also grown in specially cultivated truffle grounds called “tartufaie”, where specific wood essences and spores are planted and sown in the plants’ roots. Truffles, like chestnuts, play a fundamental role in the environmental preservation of the territory: their very presence is due to a vital “micro system”. They generate and live under the ground and have a mutual relationship with the roots of the trees they attach to and with other living beings, such as enzymes, insects and mammals. 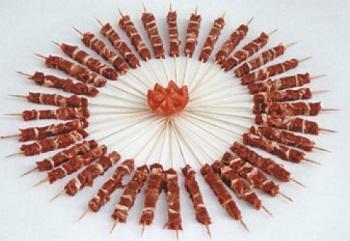 Furthermore, the symbol of this province's cuisine are the sheep arrosticini, little cubes of sheep meat cooked on a skewer. 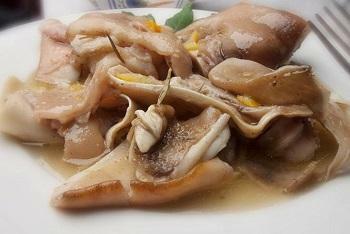 Another typical dish is the so-called 'Ndocca 'ndocca, a recipe based on the less valued parts of pork (ears, snout, trotters, tail, spare ribs...). 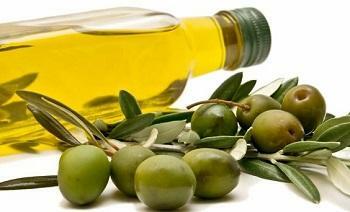 Extra virgin olive oil seasons many typical dishes of Teramo, both based on meat and seafood. Along the coast it is possible to taste the sea hors d'oeuvre alla giuliese, typical of Giulianova: it is based on prawns, squids, clams and soles. 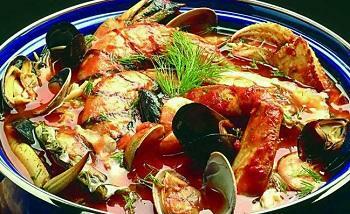 At Christmas Eve it is traditional to cook stock fish: it's a very tasty dish that needs a three-days’ preparation and is based on oil, onion, spices, chestnuts, nuts and raisins. The Millefiori mountain honey is also a tasty local specialty. 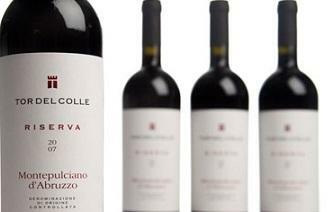 The most appreciated typical wines are: the Montepulciano d'Abruzzo, the Trebbiano d'Abruzzo, the Controguerra and the Colli Abrutini. 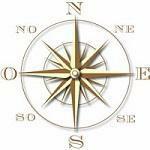 Work with us - Are You a tourist guide? 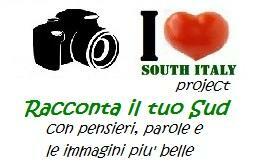 Do you organize tours to northern & southern Italy? If the thematic is based on culture, history and outdoor activities, we would love to talk to you. Drop us a line.